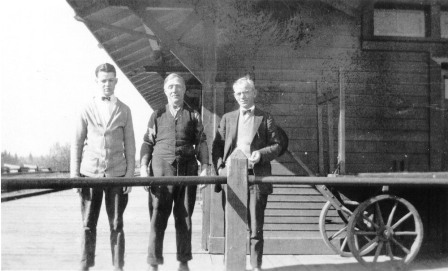 The Ruskin Station platform circa 1925 with (L to R): Norm Pelkey, Bert Kemp, and the Station Master, Frank Pelkey. Mr. and Mrs. Frank Pelkey were married in November of 1898. The Gazette reported on their 26th wedding anniversary, which was held at Ruskin Hall, playing cards and dancing the night away. Frank was the station agent in Ruskin. He rebuilt the Ruskin Store in 1926 after the original building burned down. 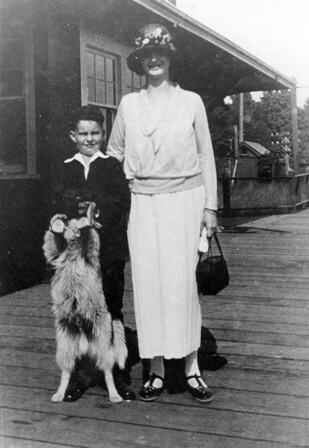 Hyacinth and Norm Pelkey with their dog on the platform of the Ruskin Station circa 1921. Frank’s daughter, Hyacinthe acted as the manager of Ruskin Store, while his wife ran the post office. Hyacinthe married John William Milliken in 1921. 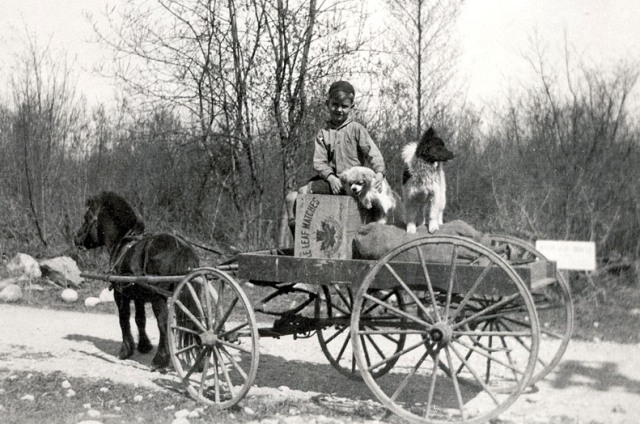 As a young boy, son Norman (more commonly called Norm) was allowed to keep his pet pony and two dogs in return for running delivery jobs and earning enough money to provide for the food the animals needed. Second daughter Gwendolin Frances Pelkey had a lovely china shower thrown for her engagement in September of 1923 in the home of Mrs. Gilchrist. The Gazette notes that tea was served at 5 o’clock and pink and white streamers hung from the chandelier to the four corners of the dining room table. Later in the month on September 14, 1923, Gwen married Mr. Vernon C. Larson of Granite Falls, Washington. After a short motor trip for their honeymoon, the couple resided in Ruskin. By June 13th, 1924, the couple’s first child was born- a daughter. Frank retired in February 1939. He passed away in October of 1942. Norm Pelkey in his pony trap circa 1923. He delivered groceries for his parents’ store to raise enough money to feed his collection of pets.